Rep. Tulsi Gabbard (D., Hawaii) officially launched her presidential campaign at a rally in Hawaii on Saturday. Gabbard, who announced her intention to run several weeks ago, spoke to supporters at the Hilton Hawaii Village Waikiki Beach resort in Honolulu. Gabbard asked supporters to embrace the principle of "service above self" and stand up to special interests and corruptions. "Join me in putting this spirit of service above self at the forefront and to stand up against the forces of greed and corruption," Gabbard said. "We must fight for the soul of our country, stand up against bought and paid for politicians who kowtow to special interests, selling their votes to the highest bidder," she continued. Gabbard – despite presenting herself as an anti-war candidate – "accepted donations worth more than $100,000 from the country’s biggest producers of bombs, planes and weapons systems," HuffPost reported last week. The donations, made between 2012 and 2016, included those from Lockheed Martin and Northrop Grumman. Gabbard went after "big pharma and insurance companies, who extort those who are sick, who put their profits above the health and well-being of our people." She called for making sure that "every single American gets the quality health care that they need through "Medicare for all." A study by the libertarian Mercatus Center projects a "Medicare for all" plan proposed by Sen. Bernie Sanders (I., Vt.) would increase government health care spending by $32.6 trillion over 10 years. The plan would also require large tax increases to make up for what employers and consumers currently pay for health care. An increasing number of Democratic lawmakers have embraced "Medicare for all," but 2020 hopefuls are now being asked to clarify whether they want to eliminate all private health care insurance for approximately 150 million Americans, an outcome many experts and critics expect of Sanders's proposal. Gabbard also spoke out against "big Wall Street banks who gamble with our money and our future," and against "overreaching intelligence agencies and big tech companies who take away our civil liberties, privacy, and freedoms in the name of national security and corporate greed." Much of Gabbard's speech focused on foreign policy, and she attacked President Donald Trump for giving in "to the wishes of the neo-cons who surround him." "We must stand up, stand up against powerful politicians from both parties who sit in their ivory towers, thinking of new wars to wage, new places for people to die, wasting trillions of our taxpayer dollars, hundreds of thousands of lives and undermining our economy and our security and destroying our middle class," Gabbard said. "Now President Trump campaigned against regime-change wars when he ran for president, but now he bows to the wishes of the neo-cons who surround him, clamoring for regime-change wars that he claimed to oppose, this time in Venezuela and in Iran," she continued. Gabbard said the money spent on "regime-change wars or on the new Cold War" should be put towards addressing "the very real, urgent needs of our people and our communities right here at home." "We must stand united and stand strong against those in both parties who never tire of war, neo-cons and neo-libs who drag us from one regime change war to the next and who are exacerbating the new Cold War, pushing us to the brink of nuclear war," she said. When the congresswoman announced her intention to run last month, she referred to "war and peace" as the "one main issue that is central to the rest." Gabbard has been criticized for her defense of Syrian dictator Bashar al-Assad, and a Washington Post op-ed called her the Syrian dictator's "mouthpiece in Washington." She expressed skepticism Assad was behind a chemical attack on civilians that prompted U.S. missile strikes in Syria in April 2017, and she stood by her decision to meet with Assad that same year. She has also appeared to justify North Korea's pursuit of nuclear weapons, saying America's "history of regime change has led to countries like North Korea to develop these weapons." Her foreign policy views have been criticized in left-wing publications such as the Nation and Jacobin.The Daily Kos slammed Gabbard for meeting with Assad and developing ties with Hindu nationalists in a piece which endorsed her Democratic primary opponent in her congressional race. 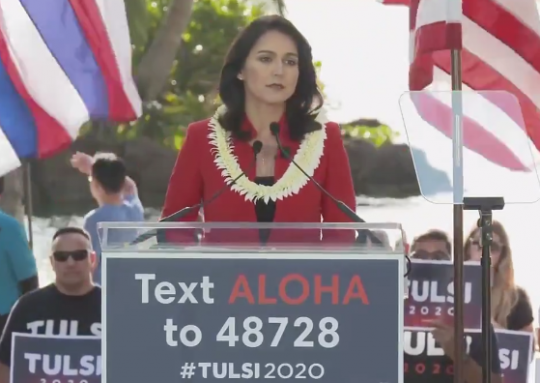 At the end of our speech, Gabbard urged Americans to embrace "the spirit of aloha, that spirit of respect and love for one another and for our country." "So I'm asking you to join me, I'm asking you to stand with me to build a movement of peace at home and abroad that will fulfill the promise of America, of freedom, justice, equality and opportunity for all," Gabbard said to end her speech. Describing a campaign in "disarray," Politico reported last week that Gabbard's campaign manager and consulting firm were expected to depart the campaign after the Saturday launch.